This trip clocked in a lot of firsts. 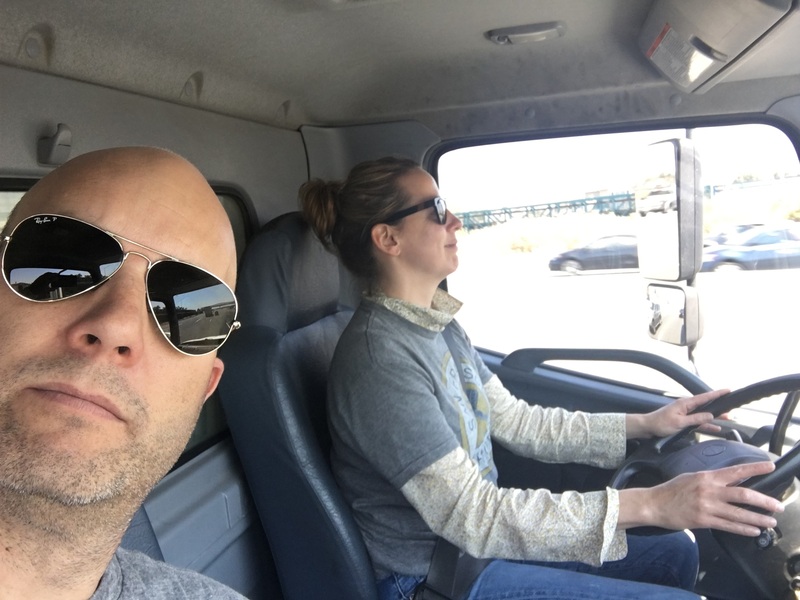 First time to drive a 22' truck – one of the largest you can rent without a special license, first time to buy fruit from anywhere but our beloved Sonoma County, first time to make a rosé! But, why? Many months prior, a favorite sommelier poured me a glass of Rosé of Cinsault-Grenache from Provence that I found genuinely inspiring. That French winegrowing region specializes in purposeful rosé – very pale in color, bone dry (zero residual sugar) with a complexity that satisfies. So many California rosés are saignée (future post on this), which is not a bad thing, but if Ernest was to begin making rosé, I wanted it to be special and with real intent. We sourced some affordable Cinsault via e-mail from the Salinas Valley in Monterrey County and off we went to collect it down that long highway. Once the crew began loading the bins, I started the arduous task of foot-treading one-half of the bins to allow the juice to enjoy skin contact for the many hours until we were back at the winery. Skin contact allows for the wine to be tinted by the red colored skins and therefore turns pink. Foot-treading is often considered to be a romantic (or gross if you don’t care for bare feet) part of the winemaking process. It’s much more like being on a grueling Stairmaster half-buried in a brambly, sludge pond than anything else. And, when the job is complete, you’re sticky. But, this is a story about the lengths we will go and so I treaded on. A paper towel sink bath at the truck-stop in King City to remove said stickiness, some beef jerky and caffeine for sustenance, a new hat for Todd just because and we then hauled 5 tons of fruit the many hours back up to the winery in Sonoma. We arrived late in the day and were able to go directly to press separating the skins from the juice. The scant color on the wine was all there was going to be…fermentation finished at zero, just as we’d hoped. And, thus, the Eugenia Rosé of Cinsault “The Country Wife” was born. Pale, lean, bright, refreshing, and 100% satisfying. We’ve learned a few lessons since that 2015 vintage…we now bunk at a motel on Hwy 101, just 20 minutes from the vineyard. And, I now wear waders – yes, fishing waders – for that cardio/bramble foot-treading. But, in our now third year of the tradition, there are some rituals that we won’t change. Harvest needs to always be at about 19 Brix, Todd always needs another gas station hat, and we always want to tackle this harvest as a truck-driving team. If you want to try the 2017 vintage of The Country Wife rosé, please book a visit in one of our tasting salons at Grand Cru here. P.S. That favorite sommelier I mentioned loves pouring our Rosé by the glass – full circle.